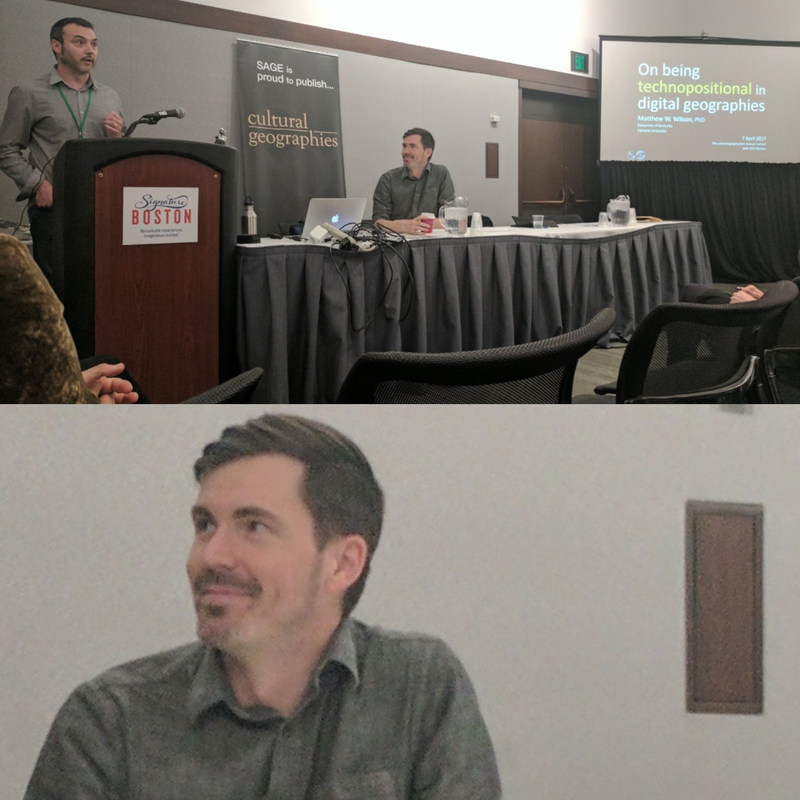 It was such an honor to give the 2017 cultural geographies Annual Lecture of the American Association of Geographers (AAG) in Boston. My lecture, "On being technopositional in digital geographies", has just been published, online first, and is free to access. Download the PDF directly, here. Many thanks to John Wylie, Dydia DeLyser, and Anna Secor and the editorial board for the invitation. Wilson, Matthew W. 2018. "On being technopositional in digital geographies." cultural geographies. doi: https://doi.org/10.1177/1474474017743030. The rising interest in the digital within geography has created an opportunity to reassert the role and responsibility of academic inquiry – to study and to do, to understand and to intervene, to put thought into action, to be technopositional. Indeed, a groundswell of interest in what is termed ‘digital geographies’ across Anglophone human geography has been marked by the recent organization of working and specialty groups of the Royal Geographical Society and the American Association of Geographers. Whether political ecologies, economic and urban geographies, critical mapping, or cultural geographies, the subfields of our discipline are increasingly digital – both in how inquiry proceeds and in the object of inquiry itself. Therefore, it is timely to take stock of the role of the digital in the wider discipline, to better articulate a distinctly technopositional stance. In this cultural geographies Annual Lecture, I reflect on the launch of the journal in 1994 (under the name Ecumene) and its relaunch in 2002. I contemplate the simultaneous technophilic currents within the discipline and the ‘GIS wars’ which were being waged at that time. In doing so, I outline current opportunities (and urgencies) for technocultural geographies which are responsible and responsive, situated by the shifting registers of the digital in geographical scholarship, public imaginaries and attention economies, and radical engagements.